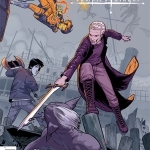 With Dawn and Xander stuck in the other dimension, it’s up to the Scooby gang to retrieve their friends without destroying Earth in the process. But it seems like someone they once trusted has ulterior motives filled with power and destruction. Maybe Earth’s not so safe after all. Dawn and Xander are hanging out in the other dimension, surviving and exploring. Dawn’s feeling out her new powers, too, and it seems like being the powered-up Key has some advantages — not the least of which is the respect it commands. When a local attacks Xander, Dawn proves to be the Goddess everyone thinks she is. But Dawn’s also a scared young woman who wants nothing more than to go home if it wouldn’t mean Earth’s destruction in the process. Xander’s a wonderfully strong presence at her side, though, and keeps assuring her that their friends will find a way to save them. They just have to be patient. Besides, they’ve got plenty to keep them busy in the meantime. They learn about the devouring rain, and Xander becomes the hero among the locals by bringing knowledge of slanted roofs to them. Now they can have sustained shelters without having their roofs destroyed by acidic rainstorms. And the locals aren’t the only ones taking an interest in Xander. He and Dawn seem to be drawing closer, perhaps even moving back into love territory. Maybe they’ll be a couple by the time Buffy gets back to them. 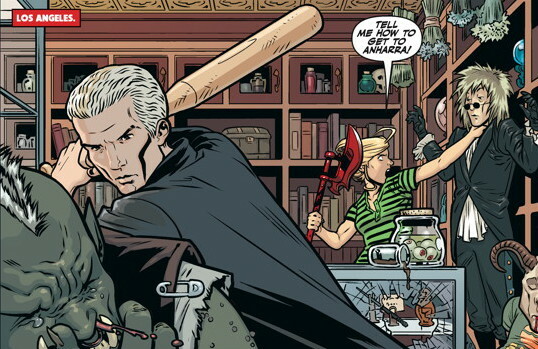 Meanwhile, in LA, Buffy and Spike are roughing up someone for information on how to get to Anharra, but he cannot help them. There seems to be no easy way back for Dawn and Xander, but that doesn’t mean Buffy’s going to give up easily. She’s ultra-testy over the lack of information, going so far as to blame Willow and Giles for focusing on their new relationships more than getting Dawn and Xander back. And when she feels like her friends are ignoring the most important mission, she wants to go right to the Vampyr book for help. Thankfully Willow, Giles, and Spike talk her out of that, but she is still no further along in getting her sister back. And if that wasn’t bad enough, it seems like their former ally is actually an enemy. D’Hoffryn is killing members of the council, being evil and, when he finally shows up, he exerts his new-found power in order to get his hands on the Vampyr book himself. Plus, back in the other dimension, Wolfram and Hart lawyers know that Dawn and Xander are hanging out there, so they might be in danger as well. It’s bound to get worse before it gets better, for everyone involved.